The Boston Modern Quilt Guild has announced a new charity project to benefit Boston, Quilts for Boston. 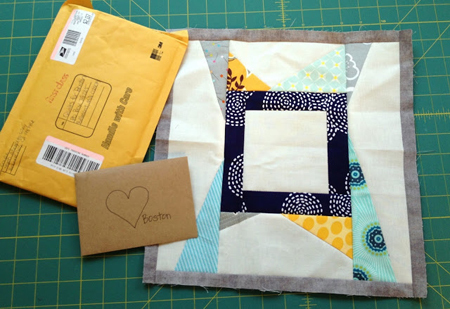 The BMQG is looking for help to benefit those directly affected by the tragedy in Boston with bright, cheerful modern quilts! In order to finish the quilts and distribute them in a timely manner, the BMQG is asking for any donations to arrive no later than May 24th, 2013. Visit the official Quilts for Boston blog post to read about the specific requirements for making blocks for the project, and to find details about where to mail your donations. If you need some inspiration or ideas on what kinds of blocks to make, be sure to check out pictures of Quilts for Boston official flickr group.